Worldwide Spin in Public Day is Saturday, September 19th, 2009. I'm not one to buy into national or international whatever day, but I love seeing public spinning and knitting. There don't seem to be any locations listed in the UK. I can only assume that we're all too busy thinking about talk like a pirate day instead! It's come to my notice a little bit late to try and organise something, but if you can get out to spin on the 19th, take some pictures (I will too). I'll set up a photo group as soon as I can. Read more about Worldwide Spin in Public Day. 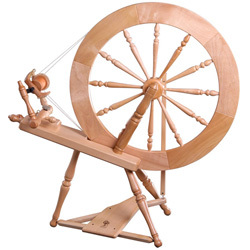 will be at a bike rally but will have my drop spindle so will bribe some drunken biker to take a photo :-) assuming I am sober enough to remember myself! !